I wrote this piece about a year and a half ago at an English teacher conference here in Georgia. It’s about my grandparents’ garden. My grandparents kept a garden, or to be more precise, several gardens in their yard. 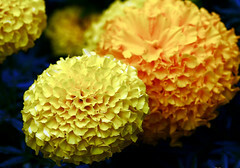 In the front yard, right in front of the front door, they grew marigolds with large, bulbous orange and yellow heads, almost too perfect and too similar to look real. Around the corner from the front door, on the side of the house they grew roses. You had to be careful with the roses. They were beautiful, but terrible. In the backyard, way in the corner of the yard, they planted purple irises. The power lines hung low over their backyard, and I can never hear doves today without being once again in the back yard. The other two gardens were devoted mainly to experiments. Granna usually had some zucchini going, but we tried watermelon with some success, and one year she let me pick out some seeds, and I grew some pretty little flowers that looked like closed mouths. I could squeeze right under the bud and make the mouths look like they were talking. Princess was buried in the corner of the garden with a little wooden cross to mark her resting place. The grass was thick and green and cool under my bare feet in the summer. We used to lie under the bean tree in her front yard at night and look up into the sky filled with stars and almost feel like we were falling into the sky. I knew how much work went into cultivating this yard. Every year I somehow wound up being dragged along to Dardano’s Flowerland for the big spring trip. We circled around the greenhouses for hours as they puttered, inspecting and selecting plants. I tried to do anything to relieve the boredom. I looked for rocks with green moss growing on them under the wet flower trays. I touched all the plants. It seemed like the yard was transformed as if by magic almost overnight somehow into a wonderland of plants and trees and flowers. The sprinkler ran every other day; Papa never tried to cheat the water restrictions that I knew of, but his lawn was always verdant and lush. My great grandmother also loved flowers and animals. She had a beautiful garden and brought some of her plants and roses with her to Texas from Georgia. We still have some of the roses in the family that were made from cuttings. Your writing about the garden was lovely. What a great legacy. I don’t think my bunch brought anything like that, but who knows? Maybe.